Everly Swan's iced tea shop has quickly become a favorite in the quaint seaside community of Charm, North Carolina. 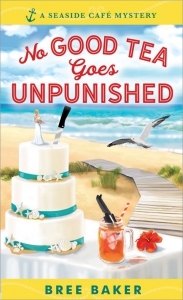 Thanks to an unusually busy tourist season, word of her delectable creations has traveled all the way to Martha's Vineyard, swaying an old friend and her high-profile fiancé to tie the knot on the beach right outside Sun, Sand, and Tea. When the couple requests that Everly cater the entire event, she is thrilled to accept the offer - and all the wonderful exposure that's sure to come with it. But before the wedding bells can ring, Everly finds the groom's body heading out with the tide and it's up to Everly to catch the culprit! Iced tea shop proprietor Everly Swan lands in hot water when a wealthy groom-to-be is found dead outside her café.